The Corin Chronicles spans galaxies and thousands of years, following a chain of events that touches the lives of gods and kings and commoners. Here’s a brief look at the characters who make up Volume 1: The Light and the Dark. The youngest child of King Oncelot and Queen Mariam of Corin, Princess Alexis is an eighteen year-old lady blessed with great beauty and allure. Many suitors have been presented as her future husbands, but none have won her affections thus far. The newest addition to Earth’s Brotherhood of the Keep, Agent Sharp has been an FBI agent for just three weeks. He is an expert marksman with great instincts. He quickly becomes friends with Karl Hobbs, and they develop a strong bond that goes beyond professional partnership. Karl Hobbs’ superior and senior member of The Brotherhood of the Keep, U.S. Senator Angus Walsh recommends new recruit Andrew Sharpe. Senior member of the Corin council, Abaros served as King Oncelot’s primary advisor for many years before a feud drove a wedge in their friendship, almost splitting the council into two factions. He is one of the only men said to have ventured into the Dark World and lived. The creator of all things, the Devine Deity, and God of Gods, Auphora’s home lies within Mount Pyro on the planet Shoraux. Widely known as the Red God of Corin, Baran is Auphora’s eldest son and ruler of the planet Corin. His feud with immediate younger brother, Feliath, is thought to have been the main catalyst for the Battle of Corin. The god of the sea and Baran’s youngest son, Baranthian has the power to create and restrict the flow of water. He is considered one of the most powerful deities in the universe. His life-force is intricately linked to the Hyper Lord, Levin, who remains by his side at all times. A mysterious young man who moves from location to location on Earth, some people suspect Charles Thomas of being the ancient legendary being, Siroco, whose destiny is to bring destruction and anarchy to Earth. The eldest of three wise men known as the Philosophers, Copelcius advised the Red God closely during the battle of Corin. Along with his brothers, Copelcius—an immortal—was imprisoned in the dark world of Corin by Auphora after the fall of Baran. The second of the three wise men, Corinthus—immortal like his brothers—is imprisoned for five thousand years in the dark world of Corin at the pleasure of Auphora. Ruler of the planet Crandor, the god Craxin is Auphora’s third son and was thought to be extremely close to Baran. Calm and reasonable, his betrayal of the Red God may have helped to swing the Battle of Corin in Auphora’s favour. The Hyper Lord of Fire, Diavos was created specifically to serve as the second half of Eclipse’s life-force, thereby inheriting his master’s ability to manipulate fire. The God of Fire, and Baran’s first born son, Eclipse’s birth was considered an abomination at the time by all in the Galaxy. Unable to live independently, Eclipse’s life-force is intricately linked to the Hyper Lord, Diavos—a form of demi-god—who remains by his side at all times. God of the planet Earth and Auphora’s second-born son, Feliath is considered a diplomatic and compassionate leader who puts the will of the galaxy as a whole above that of his own planet. A former FBI agent, after the death of his wife and child, Karl is recruited by a mysterious secret society on Earth known as The Brotherhood of the Keep. He is tasked with hunting a man believed to be carrying a deadly secret. One of Prince Ramon’s childhood friends and one of four men chosen by King Oncelot to accompany the Prince into the dark side of Corin. Kasa primarily wields a long bow. The younger brother of Kraipo, Auphora’s army general, Kirinki is a successful mercenary. He transports people across the planet Tyranis in exchange for gold, diamonds, and rubies. A chance meeting with a mother and child hunted by the gods leads to a crisis of faith. The army general of Auphora, Kraipo famously led his men in the final battle for the planet Crazar, which ended in his defeat. Originally from Tyranis, he is a highly respected soldier who left his wife and brother behind, choosing to fight for the God of Gods. Commander of King Oncelot’s army in Corin, Kratz is brave and highly intelligent, able to achieve great success even when faced with great odds. The Hyper Lord of the sea, Simus, was created specifically to serve as the second half of Baranthian’s life-force, thereby inheriting his master’s ability to control water. The God of Sand and Baran’s second son, Madoron has control of sand, and can manipulate it to create sand storms and tremors. His life-force is intricately linked to the Hyper Lord, Simus, who remains by his side at all times. Wife of King Oncelot of Corin and mother of Prince Ramon and Princess Alexis, Queen Mariam frequently attends council meetings with her husband, where she is sometimes vocal in her opinions. Master Morgise introduces himself to Selena Simpa as a member of the Eight Realm—a group of men who swear all allegiance to the child known as the Anointed One. His true background is unknown. A well-respected Colonoy Master, Master Nitiri is able to wield magic in its purest form. Following his ventures into Corin’s dark divide, he denounces all association with the royal family, choosing to follow a different path altogether—one where he is free of any obligations to the gods. His brother is Master Ndu. A master of the Colonoy arts and loyal servant of the royal family, Master Ndu is one of the only living mortals in the galaxy able to wield magic. Along with his brother, Master Nitiri, he has successfully ventured into the dark world and survived. A childhood friend of Prince Ramon and an active participant of the Colonoy program, though he is not yet old enough to be recognized as a full Colonoy. Wielding a battle Axe in combat, he is chosen as one of the warriors to accompany the Prince into the dark world of Corin. The appointed king of the planet Corin, five thousand years after the god Baran’s apocalyptic battle. He lives within the royal city of Tustodes with his wife, Mariam, and two children. Firstborn son of King Oncelot, Prince Ramon serves in the Corin army and sits on the royal council. At twenty-one, he is the heir to his father’s kingdom. 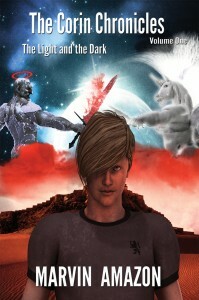 He volunteers to travel to the dark side of Corin in order to save his planet and people. Wielder of a pitchfork, Rumin is a childhood friend of Prince Ramon, and is chosen to venture into the dark side of Corin. Auphora’s fourth-born son, Sebitatus, is ruler of the Ringed planet Tyranis. He is known for his strong character and fiery temperament. A mother who flees across the galaxy to protect her ten year-old son, Selena travels across the galaxy, seeking the protection of the finest mercenaries. A secretive woman, she arouses suspicion everywhere she goes. The Hyper Lord of Sand, Simus, was created specifically to serve as the second half of Madoron’s life-force, thereby inheriting his master’s ability to manipulate sand. Ten year-old Siroco arrives on Tyranis with his mother after five years in an intergalactic portal from Corin. Fitting the description of a child known across the galaxy as the Anointed One, he is hunted by the army of Auphora. The youngest of three wise men known as the Philosophers, Smina spends five thousand years imprisoned within the dark world of Corin at the pleasure of Auphora. Part of a breed of warrior creatures created by Auphora and known as Monorois, Thane serves the God of Gods, leading the hunt on Tyranis for the child known as the Anointed One. He is considered a swift and ruthless assassin. A childhood friend of Prince Ramon, Topenga is one of the few men on Corin recognized as a Colonoy, the ultimate human warriors. His relationship with Ramon was tested when he was named as a Colonoy ahead of the prince. He is charged by King Oncelot to protect the Prince on his journey into the dark divide of Corin. The long-term partner of Karl Hobbs in The Brotherhood of the Keep, Agent Montgomery looks up to his colleague, happy to follow his lead when necessary.